On the night before Easter, Russ and I found ourselves watching The Sound of Music, which has always been one of my all-time favorite movies. I dreamt of an acting career after seeing this for the first time at age 4 or 5, hoping to be cast as the next member of the Von Trapp family. The fact that I cannot sing did not seem to be an issue for me at that time. I can recite almost every line and have to hold myself back from singing each song, especially "My Favorite Things." While I'm not sure why they always show this classic at Easter, it got me thinking about some of my other springtime favorites. It may seem like a strange combination but asparagus, raspberries and peeps are at the top of the list. It seemed fitting that these very things had woven their way into my Easter plans. After some rainy, cool weather, I was so happy the Sun decided to grace us with her presence for the weekend. She generated a baseline buzz that was palpable Saturday at the Farmers Market and around town as people busied themselves with purchases and plans for Easter. I was out getting *provisions* for an Easter brunch for 15 friends and made a beeline for the asparagus stand at the market. It's a delight to see pencil-thin asparagus stacked a foot high and 15 feet across. Asparagus, glorious asparagus. I'm glad to say that my tastes have changed dramatically since then. Asparagus is now one of my most loved vegetables. And with some bright raspberries in my sight, I picked up a few pints to make an oldie but a goodie: raspberry-asparagus medley. It rounded out the rest of the brunch menu: thyme-honey glazed ham, hash brown "quiche," Russ' applesauce, and my grandmother's buttermilk biscuits, which try as I might are never as good as hers. That's why I've asked her to will me her pans and skillets. I'm hoping they're the secret ingredient. And to properly celebrate Easter (even as adults), you've got to have the right candy, so I made sure to pick up some of the mandatories: chocolate covered marshmallow eggs, jelly beans and peeps! I got a Martha Stewart-esque wild hair when I saw the peeps and made these really cute utensil rolls. They were the perfect compliment to the sunny daisies and wheat grass (which the cat would not stop eating) I arranged as the centerpiece. But the real highlight of the brunch was not the food or decorations. 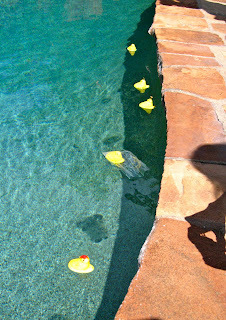 It was the First Annual Peep Regatta. What, might you ask, is a Peep Regatta? It's the synthesis of a bunch of guys sitting out by the pool eating peeps and drinking Bloody Marys when one of them tosses out the question, "Hey, what do you think happens if you put a peep in the pool?" I'm sure you get the picture. and a photo finish to determine second place. Unfortunately, our friend Ryan's idea of creating a sail made from toothpicks and Splenda packets back fired. I have to admit I was worried the bright yellow fellows would melt once they hit the water. I'm happy to report that they're resilient little creatures. And people are already buzzing about how to pimp their peep to walk away with the winner's cup next year. This can be whipped up in minutes, serves a crowd and there is never any left over, which I take as the ultimate compliment. And for brunch, I was looking for something that was more interesting than your typical fruit bowl. Combine first four ingredients in a small saucepan and bring to a boil. Remove from heat and stir in lemon zest. Toss the asparagus in the raspberry mixture and place on a serving platter. For a more impressive presentation, make sure your asparagus are all pointing in the same direction. Sprinkle the fresh raspberries over the asparagus and drizzle the fresh lemon juice on top. For the final touch, sprinkle the pecans all around. Yields: Six servings.